It is an unedifying experience but an illuminating one – for this once glamorous thoroughfare, a few blocks from Miami Beach’s art deco waterfront and its white beaches, has taken on an unexpected role. It now lies on the front line of America’s battle against climate change and the rise in sea levels that it has triggered. Today, shop owners keep plastic bags and rubber bands handy to wrap around their feet when they have to get to their cars through rising waters, while householders have found that ground-floor spaces in garages are no longer safe to keep their cars. Only those on higher floors can hope to protect their cars from surging sea waters that corrode and rot the innards of their vehicles. Hence the construction work at Alton Road, where $400m is now being spent in an attempt to halt these devastating floods – by improving Miami Beach’s stricken system of drains and sewers. 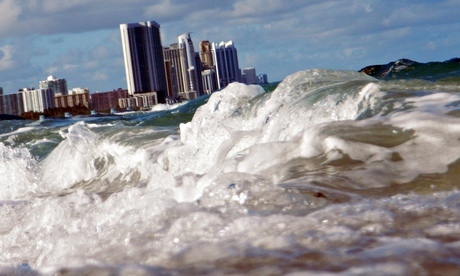 In total, around $1.5bn is to be invested in projects aimed at holding back the rising waters. Few scientists believe the works will have a long-term effect. 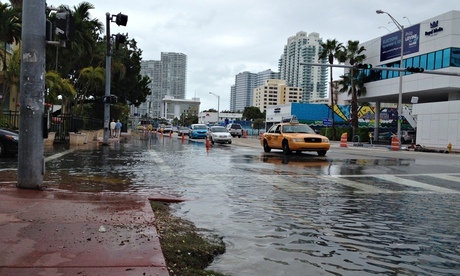 What makes Miami exceptionally vulnerable to climate change is its unique geology. The city – and its satellite towns and resorts – is built on a dome of porous limestone which is soaking up the rising seawater, slowly filling up the city’s foundations and then bubbling up through drains and pipes. Sewage is being forced upwards and fresh water polluted. 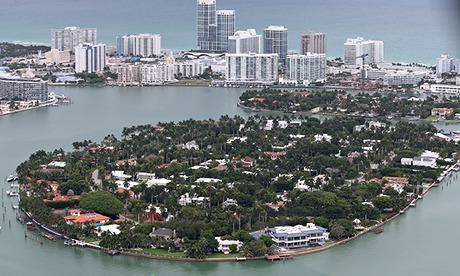 Miami’s low topography only adds to these problems. There is little land out here that rises more than six feet above sea level. Many condos and apartment blocks open straight on the edge of the sea. Of the total of 4.2 million US citizens who live at an elevation of four feet or less, 2.4 million of them live in south Florida. At Florida International University, geologist Peter Harlem has created a series of maps that chart what will happen as the sea continues to rise. These show that by the time oceans have risen by four feet – a fairly conservative forecast – most of Miami Beach, Key Biscayne, Virginia Key and all the area’s other pieces of prime real estate, will be bathtubs. At six feet, Miami city’s waterfront and the Florida Keys will have disappeared. The world’s busiest cruise ship port, which handles four million passengers, will disappear beneath the waves. “This is the fact of life about the ocean: it is very, very powerful,” says Harlem. Miami and its surroundings are facing a calamity worthy of the Old Testament. It is an astonishing story. Despite its vast wealth, the city might soon be consumed by the waves, for even if all emissions of carbon dioxide were halted tomorrow – a very unlikely event given their consistent rise over the decades – there is probably enough of the gas in the atmosphere to continue to warm our planet, heat and expand our seas, and melt polar ice. In short, there seems there is nothing that can stop the waters washing over Miami completely. It a devastating scenario. But what really surprises visitors and observers is the city’s response, or to be more accurate, its almost total lack of reaction. The local population is steadily increasing; land prices continue to surge; and building is progressing at a generous pace. During my visit last month, signs of construction – new shopping malls, cranes towering over new condominiums and scaffolding enclosing freshly built apartment blocks – could be seen across the city, its backers apparently oblivious of scientists’ warnings that the foundations of their buildings may be awash very soon. Philip Stoddard is particularly well-placed to judge what is happening to Miami. Tall, thin, with a dry sense of humour, he is a politician, having won two successive elections to be mayor of South Miami, and a scientist, a biology professor at Florida International University. The backyard of the home that he shares with his architect wife, Grey Reid, reflects his passion for the living world. While most other South Miami residences sport bright blue swimming pools and barbecues, Stoddard has created a small lake, fringed with palms and ferns, that would do justice to the swampy Everglades near his home. Bass, koi and mosquito fish swim here, while bright dragonflies and zebra lapwing butterflies flit overhead. It is a naturalists’ haven but Stoddard is under no illusions about the risks facing his home. Although several miles inland, the house is certainly not immune to the changes that threaten to engulf south Florida. Nor will south Florida have to wait that long for the devastation to come. Long before the seas have risen a further three or four feet, there will be irreversible breakdowns in society, he says. “Another foot of sea-level rise will be enough to bring salt water into our fresh water supplies and our sewage system. Those services will be lost when that happens,” says Stoddard. And then there is the issue of Turkey Point nuclear plant, which lies 24 miles south of Miami. Its operators insist it can survive sea surges and hurricanes and point out that its reactor vessel has been built 20 feet above sea level. But critics who include Stoddard, Harlem and others argue that anciliary equipment – including emergency diesel generators that are crucial to keeping cooling waters circulating in the event of power failure – are not so well protected. In the event of sea rise and a major storm surge, a power supply disruption could cause a repeat of the Fukushima accident of 2011, they claim. In addition, inundation maps like those prepared by Harlem show that with a three-foot sea-level rise, Turkey Point will be cut off from the mainland and will become accessible only by boat or aircraft. And the higher the seas go, the deeper it will be submerged. Turkey Point was built in the 1970s when sea level rises were not an issue, of course. 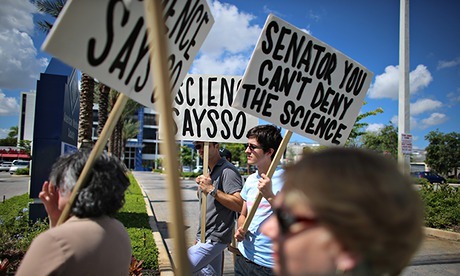 But for scientists like Ben Kirtman, they are now a fact of life. The problem is that many planners and managers still do not take the threat into account when planning for the future, he argues. A classic example is provided by the state’s water management. South Florida, because it is so low-lying, is criss-crossed with canals that take away water when there is heavy rainfall and let it pour into the sea. The problem stems from the top, Kirtman said, from the absolute insistence of influential climate change deniers that global warming is not happening. “When statesmen like Rubio say things like that, they make it very, very hard for anything to get done on a local level – for instance for Miami to raise the millions it needs to build new sewers and canals. If local people have been told by their leaders that global warming is not happening, they will simply assume you are wasting their money by building defences against it. Thus one of the great cities of the world faces obliteration in the coming decades. “It is over for south Florida. It is as simple as that. Nor is it on its own,” Wanless admits. With eight power stations, 35 tube stations and all of Whitehall in the tidal Thames floodplain, the threat of floods has long loomed large, posing a risk to the economy, infrastructure and national heritage. With sea level rises and increased rainfall on the cards thanks to climate change, measures are being put in place to revamp and boost the ageing flood defences. Meanwhile, the south-east of England is sinking by around 1.5mm a year. The Dutch are often looked to as the masters of flood defence engineering with their impressive array of dams, dikes and barriers. It’s a skill they have had to acquire as almost half the population lives less than 3ft above sea level and many livelihoods depend on the country’s strong flood defences. They have adopted a “live with water, rather than fight it” attitude in recent years, with innovations including “floating homes” being built in Amsterdam. Bearing in mind that roughly half of New Orleans is below sea level, its future in terms of coastal flooding does not look too bright. Indeed, according to the World Bank it is the fourth-most vulnerable city to future sea level rise in economic costs, with predicted average annual losses of $1.8bn in 2050. It is predicted that rising waters and subsiding land could result in relative sea level rises of up to 4.6ft by 2100, one of the highest rates in the US. The Maldives is generally thought of as an island paradise but is critically endangered by the rising ocean that both supports and surrounds it. Of its 1,192 islands, 80% are less than 3ft above sea level, with global warming putting the Maldives at risk of becoming the Atlantis of our time. So perhaps it is unsurprising that the Maldivian president is looking at the options of buying land should the country’s 200 densely inhabited islands need to be evacuated.There’s even a pot of money especially allocated for buying land overseas and moving the islands’s residents to safer ground. Bangladesh is a nation in which three majestic Himalayan rivers converge, before meandering their way to the sea via the Ganges delta: beautiful on a map, but not ideal in terms of river flooding, or tidal flooding for that matter. The country is basically a massive floodplain, with more than 20% of its land awash with water every year and around 70% experiencing severe flooding in extreme cases. As one of the world’s least developed countries, it cannot afford the technology others use to mitigate the effects of flooding and has to turn to more imaginative means, such as creating houses built on stilts in coastal areas.